William Henry Powell’s dramatic and brilliantly colored canvas was the last of the eight large historical paintings in the Rotunda commissioned by the Congress. 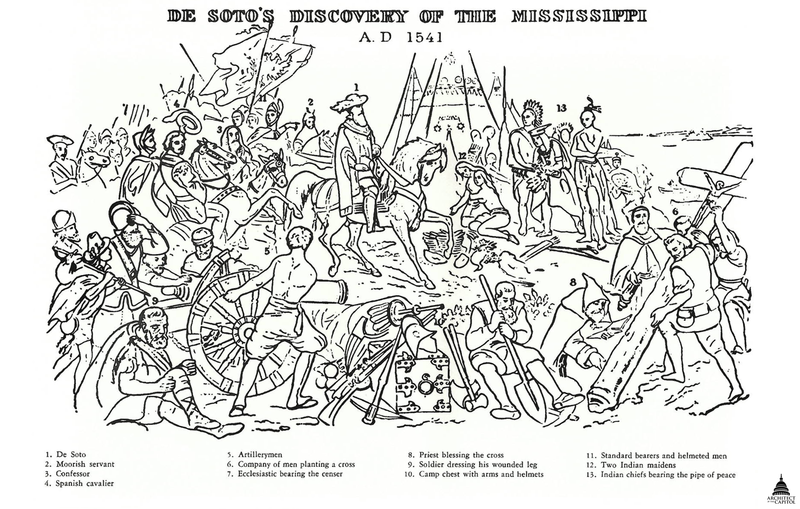 It shows Spanish conquistador and explorer Hernando De Soto (1500–1542), riding a white horse and dressed in Renaissance finery, arriving at the Mississippi River at a point below Natchez on May 8, 1541. De Soto was the first European documented to have seen the river. As De Soto and his troops approach, the Native Americans watch warily but quietly before their tepees, and a chief holds out the pipe of peace. The central area of the painting is filled with light and color, set off in dramatic relief by the foreground figures in shadow, and the dark forest at the left contrasts strongly with the bright sky on the right. In the foreground, weapons, armor, artillerymen moving a cannon, and a soldier wrapping a wounded leg suggest the attack by Indians that took place the day before. To the right, a monk prays as men set a newly constructed crucifix in the ground. Above this group and fading to the horizon is the Mississippi River, dotted with native canoes, small islands, and a tree being borne downstream; the lightly forested opposite bank is visible along the skyline. Powell based his scene on published accounts and histories, including Theodore Irving’s 1835 The Conquest of Florida by Hernando de Soto. A year later, after De Soto died of a fever, his body was buried in the river, as shown in Constantino Brumidi’s frescoed Frieze of American History above the painting. Click on the image above to enlarge the key. American painter William Henry Powell (1823–1879) was the last artist commissioned by the Congress to create a painting for the Capitol Rotunda. He replaced Henry Inman, his former teacher, who was commissioned to fill one of the frames in the Rotunda, but who died in 1846 before completing his painting showing Daniel Boone emigrating to Kentucky. Powell, who chose a different subject, worked on the painting in Paris from 1848 to 1853, basing the Spaniards’ costumes and equipment on specimens in the Museum of Artillery. He had a color lithograph made of the painting and exhibited the canvas in Harrisburg, Pennsylvania; Baltimore, Maryland; and New York City before bringing it to Washington, D.C. The painting has undergone various cleaning, revarnishing, repair and restoration treatments since its installation. In 1982 the painting was lined to an aluminum panel to help it resist the effects of changes in temperature and humidity. All of the Rotunda paintings were most recently cleaned in 2008. Engravings of Discovery of the Mississippi by De Soto have appeared on the reverse of two United States bank notes: a $10 note in the 1860s and a $500 note in the 1918 series. William Henry Powell was born in New York City on February 14, 1823, and raised in Cincinnati, Ohio, from infancy. His youthful interest in art was encouraged by a local philanthropist, and he received instruction. At the age of seventeen he returned to New York, where he became a pupil of Henry Inman, and he later studied art in Italy for three years. Initially recognized for his portraits, he moved into the field of history painting, which led to his work for the Rotunda. The success of Discovery of the Mississippi by De Soto led the Ohio legislature to commission him to paint The Battle of Lake Erie (1873), a scene of Commodore Perry’s famous victory. This work, still displayed in the Ohio Statehouse, prompted the Congress to commission a larger version, which hangs in the east Senate Grand Staircase in the Capitol. Powell’s other history paintings include The Siege of Vera Cruz, The Landing of the Pilgrims and Washington at Valley Forge. His portraits include depictions of Washington Irving, Peter Stuyvesant, and General George B. McClellan. He died in New York on October 6, 1879.